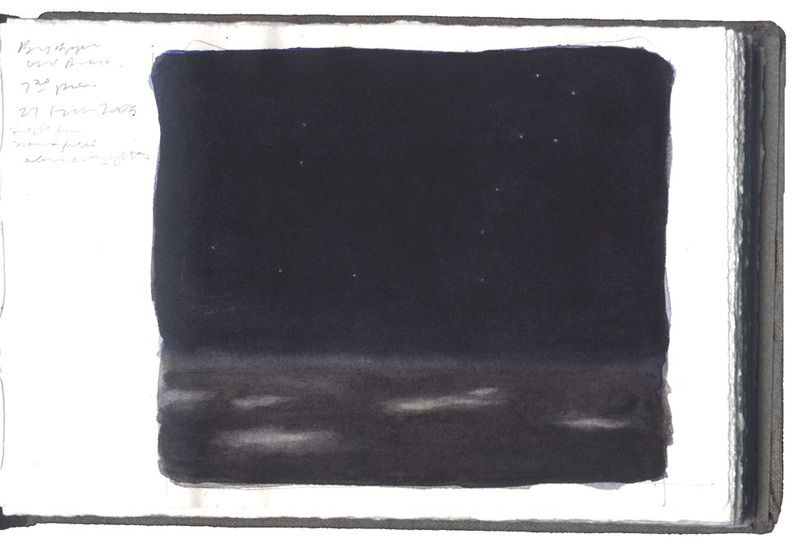 Book 130, Sketch of northern sky above illuminated towns, 7:20 pm, 27 February 2008. Flying home from a trip this week I leaned my head against the window and drifted, blinking awake occasionally to see the light of the tumbling sun spread into pale rainbow bands above a plain of stratus clouds. I had been reading Jeff Warren’s recent book The Head Trip: Adventures on the Wheel of Consciousness, a fascinating study about the many levels of consciousness; not limited to waking and sleeping. I must have taken a subliminal cue from my reading because soon I was drifting into the afternoon with closed eyes. When I blinked awake it was darker. The sun had slipped further down and the color bands lifted higher. Another blink and I was gone. I awoke surprised by blackness. At first my disoriented eyes struggled to find anything. Then, out of the darkness emerged the Big Dipper (Ursa Major) balanced by winding stars of the Dragon (Draco). Below, the clouds were gone and I saw the patchy glow of several towns floating in the void. Words popped into my head, “This is where the dragon lives” the opening line of Wallace Stevens‘ poem The Auroras of Autumn. I had the strangest sensation; was I asleep or awake, was this dream or reality, imagined or real? Is this a dragon or is this air?